Want a simpler day in your own free time? No snow shoveling when you arrive or spending your Sunday on cleaning. Now you can get the perfect cabin feeling in a beautiful apartment - without all the cabin hassle and maintenance. Soon, 36 new apartments will be wall-to-wall with Vestlia Resort, which has ALL of the facilities both you and your children will love. This project will have a unique location today and in the future. 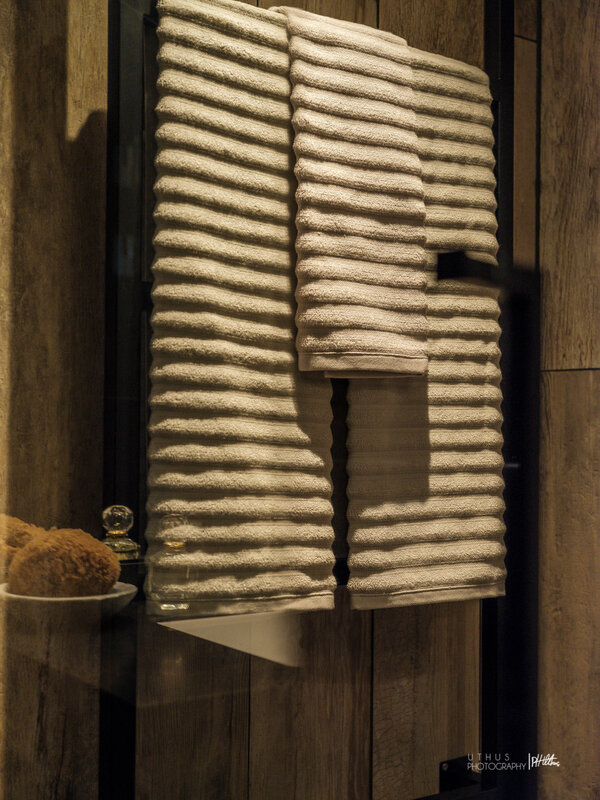 With an apartment in Vestlia Lodge you can feel free from worries and just enjoy life. The new apartments are spread over 2 buildings of 3 floors. There are 2-4/5 bedroom apartments from about 44 to 118 m2 with great location, ski in / out and short distance to everything you want at Vestlia Resort. Own garage under the building with storage and elevator up to the apartment, allows you to walk dry-shuttled from the car to the apartment every winter. The parking garage will be installed in April 2018 and concrete and floor dividers will be installed in the summer of 2018. Moving in date is expected in December 2018 if everything goes according to plan. Floor plans attached will be adjusted by the developer. If you book an apartment in an early phase (March-June 2018) you can influence the room solution. NB. If you want an apartment from 130 m2 to 150 m2, we can draw 2 apartments to 1 large apartment. Live SKI IN / OUT to both Vestlia Resort and the ski tracks. FROM CA 43 TO 118 M2. 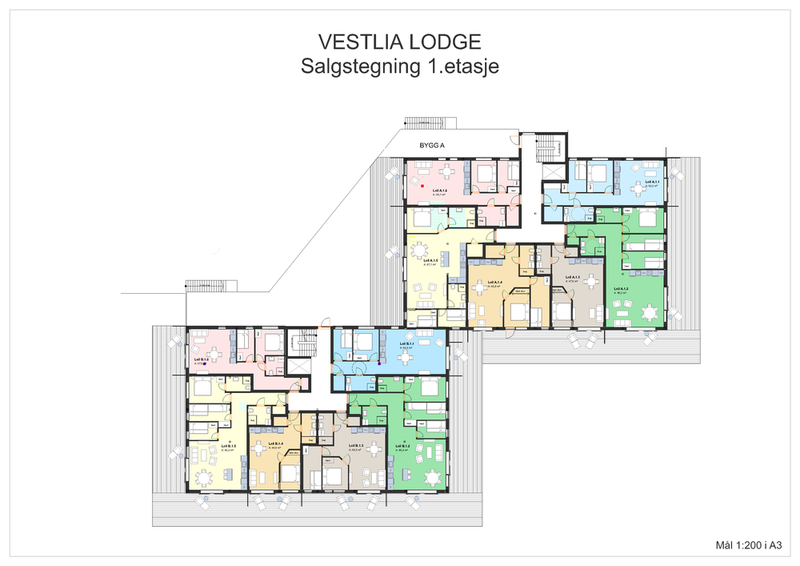 Preliminary floor plans Vestlia Lodge. Building A is closest to Vestlia Resort. 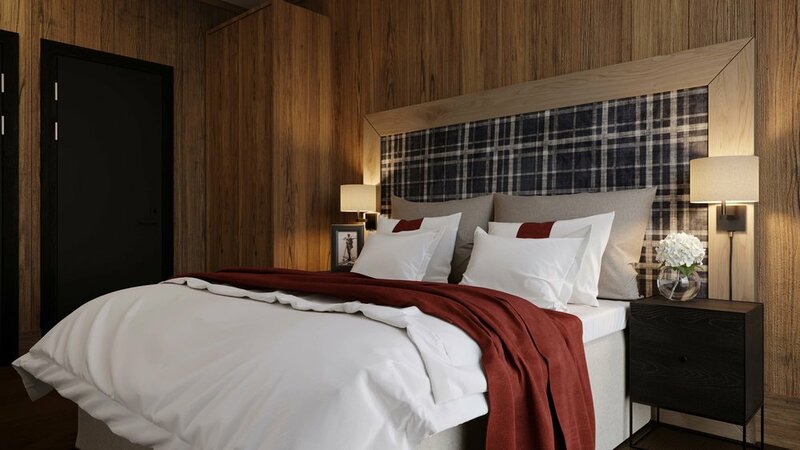 Vestlia Resort appears as Geilo's most complete holiday resort in a fantastic location at the bottom of the alpine ski slopes and right next to the cross-country tracks. Vestlia Resort is a cozy and warm lodge hotel. The hotel was beautifully decorated by the well-known interior designer Helene Hennie in 2006 and has a relaxed atmosphere. The resort was expanded with 2 new wings in 2015. New water park, 8-lane bowling alley, new reception and new parking. In January 2018 a completely new wing opens with restaurant, après ski and bar, youth room, cinema and 60 new rooms. The hotel has an exclusive spa and fitness centre - 1000 m2 for body and mind, a modern conference center, a cozy restaurant, a bar and a great banquet hall, perfect for weddings and other special occasions. The kids can enjoy one of Norway's most beautiful playgrounds, bowling alleys and the 750 sqm adventure pool with 82-metre water slide! In many projects, one as an architect must plan to prioritize different tomt qualities - view, proximity, sun, shadow, front, backside, noise ... This plot and this project have many of the ground qualities one can wish for - proximity to the hotel with pool, bowling , spa, après ski, playground, fitness center, bakery etc., proximity to ski slope, proximity to skiing, proximity to golf, proximity to nature and outstanding views. These are the benefits one must look long for to find the make. We have chosen to build the project around these gods and deliberately sought-after solutions where all residents will get their part of them. This is done by the project forming "the third wall" in Vestlia's new access. We parallel the apartment buildings, so that many get beautiful views, and arrange for terraces, which allows a boat to enjoy the view and not least the sun from most apartments. The buildings are three storey high with underlying parking baskets that have direct elevator and staircase to the apartments. The parking dock can be attached to existing parking lots so that one can attain the facilities at the Vestlia Resort if desired. Each building has 6 apartments on each floor. The tiles in the building have large windows facing the sun and the view. Most apartments are organized so that the living room and kitchen are located against the gable with access to the terraces. The apartments range in size from about 43 to 118 m2 in 2- to 4/5-bedroom apartments. If you want an apartment from 130 up to 150 m2, we can build 2 apartments. The main apartments have both two terraces facing southeast and southwest with a large roof railing in the long wall. Owners Club is an exclusive member club for owners at Vestlia Lodge, which facilitates the owners to enjoy their free time. Members will receive invitations to events and concerts, as well as many other benefits at Vestlia Resort and Geilo. All members of Vestlia Lodge Owners Club have free entrance to the big adventure pool, playland and fitness center at Vestlia Resort. The benefits will be adjusted every year. Owners can make use of the Vestlia Resort's shared services such as apartment cleaning, book your own chef and waiter, etc. Price 500 0 kr per family per year in membership fee. First year free. Vestlia Resort can adjust the benefits on 31.12 each year. Owners of the apartment at Vestlia Lodge become part of Geilo's most unique membership club. We are also working on a membership card that serves as a payment card associated with the membership. Every member will have their own card and you can give your children the opportunity to shop at Vestlia Resort on their own. This means that you can also create a payment agreement with us, where we charge your usage per month. This is usually linked to a credit card. The membership card also serves as an admission card, and it is therefore important that you contact Vestlia Resort before the start of the season to receive or update your membership card. * The card and benefits of Owners Club members are up for review and adjusted from season to season. The benefits are managed and determined by Vestlia Resort. Owners Club with special benefits. The apartments' very attractive location ski in / out, their proximity to Vestlia Resort, as well as the lovely design, make them popular rentals. Vestlia Resort alone has invested 300 million in the resort since 2015, and the ski resort has invested millions of kroner and has big plans for the slopes in the next few years. The location between Oslo and Bergen makes Geilo a very attractive place for both Norwegian and foreign tourists. All this is a good starting point for good rental income and value appreciation in the years to come. An apartment at Vestlia Lodge will be a very good investment now and for future generations. An apartment here will take your free time to new heights without maintenance, snow shoveling and worries. Here you just have to ENJOY life. Put the car in the garage, leave it there until you go home. Register your interest for apartments in Vestlia Lodge. 10 sold. Thank you for your interest. Our realtor will contact you soon.